The Super Bowl is in only two days. It features the Patriots and the Rams -- the best of the AFC and NFC. And it’s a celebration of America’s love of competition. Football is a huge business in the U.S. with over $12 billion spent annually on NFL tickets and products. In the same vein, the RV industry is uniquely American and grosses over $20 billion per year – almost twice that of the NFL. There are few industries in the world that are unique to America, and the RV business is lucky to be one of them. Warren Buffett always talks about the best industries to invest in as being those that “have a moat” – and there’s no greater barrier to competition than being a truly American original (which is probably why he is the largest investor in Coca-Cola). Enjoy the Super Bowl! There’s an old industry adage that the best time to buy a northern RV park is in the dead of winter. It makes logical sense as what owner would not want to retire when they’re out in the snow trying to fix a frozen water line while dreaming of Hawaii. But if you can get the best prices when it’s snowing out, how do you do the diligence at that time of year? It’s not as hard as it sounds. If you refer to the guide to RV park due diligence that we wrote years ago (30 Days of Diligence) you will note that most of the items you need to obtain and verify are accomplished by phone, email or writing, and are not weather-dependent. Getting the Certificate of Zoning from the city is unaffected by 3’ of snow. Getting the last three years of power bills from the power company is not reliant on the roads being free of ice (as long as the internet is working). So the bottom line is that 80%+ of diligence work has nothing to due with the current weather conditions. However, there are some diligence items that are impacted by snow and bad weather. These include the visual inspection of the property, as well as confirmation of the normal occupancy. You just can’t see what’s under the snow, nor can you see the normal summer occupancy in winter in a seasonal RV park. However, you can’t wait until the Spring to do the diligence on a deal you sign up in December. So you just have to do your best. What’s under that tarp over the pool? Is it in great condition or a total wreck? What about the parking pads or even the rough on the office? These will require some degree of guesswork. If the roof on the office is shot, you will see evidence of leaking on the ceiling, right? And even in the snow you can feel if the basketball court is solid or nonexistent. Hire a professional to inspect these features, as they are used to doing it year round and know how to make a better educated guess than you can. Even in the snow you can see potholes typically, as those depressions settle in with the snow fall just like they do with the rain. Additionally, put on your galoshes and walk the roads and you’ll see if they are flat and solid or if they feel rough and uneven. On top of that, there is typically some point in even the hardest winter when the sun breaks through for a day and melts off the snow. Hire someone on Craigslist for $50 to go film the park’s roads when the weather service says that’s occurring. All RV park values are based on revenue, and yet a winter park occupancy is typically not very impressive. Some northern parks, in fact, close for the season as winter approaches. So how can you stand in a nearly vacant RV park and believe that it was full starting in Spring? The solution is to monitor the byproducts of occupancy and their reflection of lots occupied. 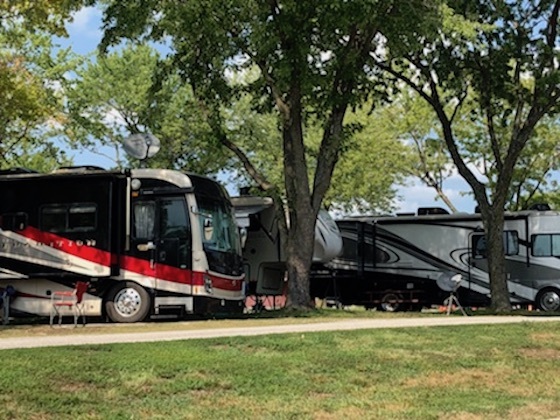 For example, almost all RV parks are on master-metered electricity – which means that all power is paid by the RV park and inclusive in the rent. With that in mind, there is a direct correlation between RV occupancy and power use. Simply estimate the coefficient of daily RV power with the power company rates, and then divide through and see how much occupancy the park truly had. The results may be eye opening. The premise that northern owners are unhappiest and most willing to deal in winter is 100% true. If they are willing to drop their price by 10% just because it’s cold and snowy, that’s a HUGE discount for the inconvenience of conducting diligence during that time of the year. If you really look at the math, you should be happy to do diligence in winter as a buyer. It makes total financial sense. You can do proper due diligence in the winter. We’ve done it many times. You simply have to work smart and relish the fact that you’re getting an extra good deal. 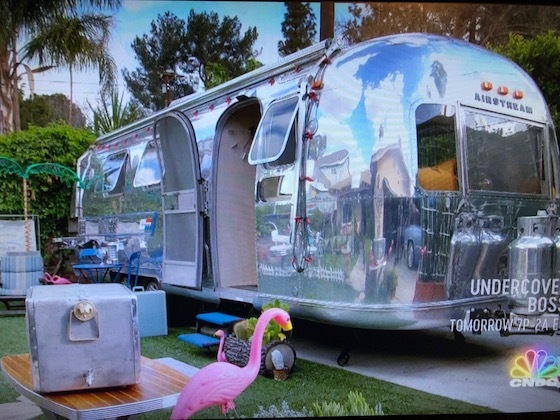 Jay Leno’s Garage is a show typically devoted to classic cars, but in a recent episode the guest was the owner of an Airstream trailer. Actually, it was Bob Wheeler, the President of Airstream and he was showing off a 2013 “Land Yacht” – a model with an interior that resembles a sleek Italian boat. Featuring a back bedroom with flat screen TV, a dining table that raises and lowers, and upscale, curving cabinetry, this RV would be the envy of any movie star on location. It’s amazing how long-lasting the desirability of the Airstream brand has maintained – it will be 100 years old in about 2030. Can you name another product that has remained true to its original design for a century and still exceeded customer expectations? If you are buying an RV park that is valued at $2 million or more, you should take your financing very seriously. There are many, many options for a property at that price point. Learn the options by enlisting the help of a “capital consultant” – and the best in the business is M.J. Vukovich from Bellweather. He will build your loan package, hit the lenders (including conduit and Agency debt offerings), present the offers to you, help you select the winner, and then manage the lending process to completion. We use him on all of our deals, and it has improved the type and quality of the financing we receive. For a free consultation, contact MJ at (612) 335-7740 and let him tell you what he can do for your property, or email him at [email protected]. It would be great if all sellers were completely reasonable on their pricing, factoring in all the defects and acknowledging the true net income and the correct cap rate to apply to that stream of cash flow. However, it’s not a perfect world out there. Sometimes the seller is unreasonable about their asking price and refuses to mark it down to where you want it to be. So how do you bridge that gap? We are not including those situations where the buyer and seller are off my hundreds of thousands of dollars – that’s not a “bridge” situation but more like Evil Knievel jumping the Snake River in a rocket ship (and don’t forget that even he pulled the ripcord only seconds after launch). So, for the sake of this discussion, we’re going to limit the “bridge” to 20% or less of purchase price. What can you improve on? So if you’re trying to rationalize over-paying for an RV park based on current income, what gives you that ability and still succeed? There are only two areas that the new buyer can often improve on: 1) higher revenues and 2) lower operating costs. The biggest ways to grow revenues are to raise nightly rates, or to improve marketing and increase occupancy. On the cost-cutting side, it’s normally to lower payroll costs and shave a little off all categories through more efficient management. What capital will need to be injected to make this improvement? Sometimes the new owner will have inject capital to make those enhancements to the bottom line. For example, if you have to build a new sign to reach traffic on the highway, that number has to be placed into your total cost of the property. So make sure that you have properly budgeted for any necessary upgrades. How fast can these improvements be made and take effect? When trying to build a plan to “bridge” the seller’s demands, make sure to also use the appropriate timing. Any increases in revenue – even with the best marketing effort – will be gradually and seasonally appropriate. Don’t overestimate your timing on revenue increases and cost cuts. The worst thing you can do as a buyer is to put all your eggs in one basket and then fail to hit your targets. You have to always maintain a Plan B to bridge the gap if your original “bridge” is not realistic. The key item, in our opinion, is can you cover the mortgage based on current net income from the RV park? It’s one thing if you’re not making a profit and a whole different feeling if you have to feed the property every month to cover the debt payment. Why do you want it this bad? 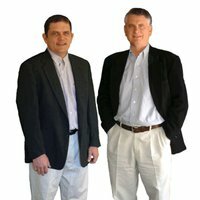 When people call us to discuss “bridging” on a deal, we always ask them “why are you willing to do that – what’s so great about this property?” The answer needs to be “because it’s outstanding on ________” and not “I don’t know, I guess it’s the first property I’ve found that I’m that close on pricing”. There needs to be a tangible reason to take that risk. 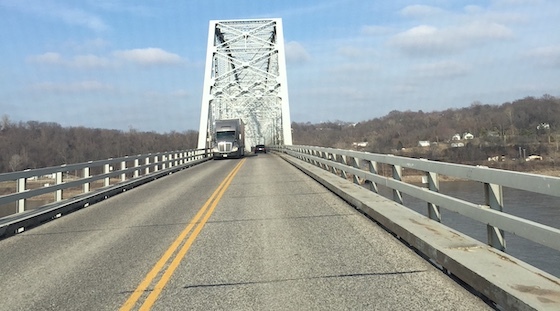 “Bridging” the difference between what the price should be and what the seller demands is a common occurrence in the RV park industry. Just make sure to do so intelligently and reasonably. Many great purchases began by the buyer theoretically overpaying and then turning the game around. We’ve done it, and so have many, many other buyers. Are Record-Level RV Sales Simply A Fad? RV sales continue to set record levels year after year. 2018 revenue was roughly 13.4% over 2017. When you see this type of popularity in an industry, it’s sometimes the sign of a fad, which ultimately leads to collapse. So a reasonable question would be is the popularity of the RV – and RV park – a fad? Or is it a permanent fixture? RV sales have been strong for over a decade now. Typically, fads have a much shorter shelf life. Remember Crocs shoes and Cigar clubs? They lasted only about a couple years before there was a huge decline in interest. So, just based on length of run, there’s no way you can say that the RV industry has been a fad. In an America that is continually grappling the issue of lower disposable income, it’s a given that RV travel is the lowest cost alternative. Even including all operating costs, insurance, and original cost of the RV, the average travel in an RV costs 59% less than traditional options. On top of that, consumer testing has proven that RV travel has other unique attributes that resonates well with the American public, including bonding with family, communing with nature, and outdoor cooking. The bottom line is that people really like RVs and RV parks. The biggest megatrend in the U.S. is the aging of the Baby Boomers. There are 10,000 Boomers retiring each day in the U.S. (a Boomer is born between 1946 and 1964). This will continue for nearly two decades. Of course, a huge number of these retirees are buying RVs and travelling America. The other megatrend that is working for the industry is that of the younger generations also liking the RV product. In fact, few people realize that the younger generation is, per capita , a bigger purchaser of RVs than the Baby Boomers. RV manufacturers have done a terrific job of improving the RV product. It’s definitely the best it has ever been, in both design and pricing. And there are a ton of options that meet almost any budget. Part of the success of the RV industry has been the result of a perpetual push to make RVs an ever-better value. And it’s working. Another reason that RV sales are so strong has been the advent of ever-easier financing for RV purchases. In the old days, if you wanted to buy a camper it was basically an all-cash purchase. Now there are as many financing options as automobiles have. That keeps consumers coming in the doors, even when the economy is tight. The RV and RV park success is not a fad. It’s the result of some seriously smart moves by manufacturers coupled with consumer satisfaction and generational patterns. It’s a great time to own an RV park. How Do You Determine An RV Park Cap Rate? 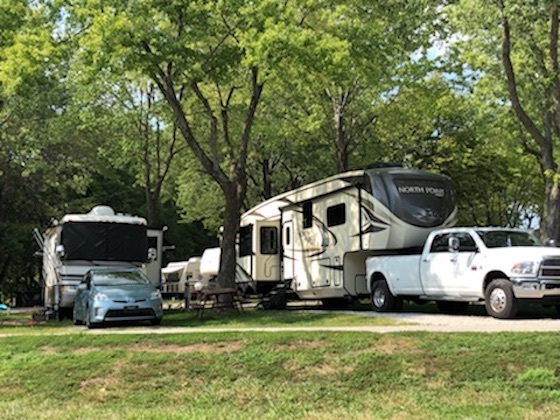 If you’re looking for an RV park to buy, you’ve noticed that the key evaluation tool in most offerings is the “cap rate”. But what does that mean? And how is that the most important part of any seller’s RV park description? Here are the things you need to know. Why is the “cap rate” so important to begin with? Wikipedia defines the “cap rate” (also known as “capitalization rate”) as “the potential rate of return on a real estate investment”. Since the whole point of an income property is to make money, obviously, a statistic that measure the potential make money is essential. Basically, the “cap rate” is like the stats that sports teams use to evaluate players, like Batting Average or RBI. The formula is net income over price paid for the property. What is the EBITDA on the RV park? EBITDA stands for “earnings before interest, taxes, depreciation and amortization” (basically the net income before your personal income taxes, mortgage payment, and depreciation). So to come up with the cap rate, the first thing you have to calculate is what revenue minus expenses yields. What is the total amount paid, including capital expenditures? The next item you need is the total cost you are paying for the RV park, including any capital expenditures you will be making post-closing (such as paving roads or building amenities). This is the true cost of the investment. Now you simply divide the net income by the cost of the RV park. It’s that simple. You can come up with a “cap rate” in seconds using the calculator on your phone. No fancy spreadsheets necessary or computer literacy. If you bought an RV park that produces $100,000 per year in net income for $1,000,000, then your cap rate would be $100,000 divided by $1,000,000 = 10%. The cap rate is 10%. And that’s a good cap rate. The RV park industry is based on a range of about 8% to 12%+ cap rates in most markets. A cap rate is a great measurement tool. But it’s only a tool. There are many factors that can make the cap rate desirable or not, such as what you can do with the property after closing. But you need to know how to calculate it if you’re going to be an effective buyer. And that’s how you do it. This is the first board game ever to feature an RV park theme. 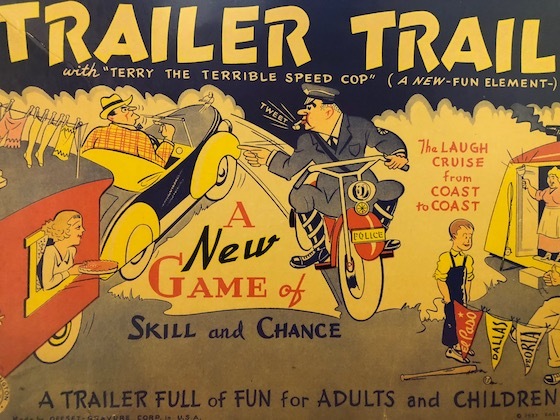 It’s called “Trailer Trails” and came out in 1937. The point of the game was to move your RV over a map of the U.S. along roads between RV parks. There were also game pieces that you would land on (just like Monopoly) that had surprise announcements like “just hung out the laundry, skip a turn” and “axle breaks, go to Chicago for repair”.